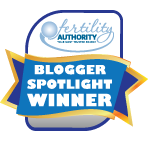 I just got the call from Dr. Amanda with the research study, and my blood work shows signs that I am starting to ovulate on my own. I have been instructed to trigger immediately (or when I get home from work, since I conveniently left my scary injectable meds and giant syringe at home), and then report back for IUI tomorrow morning. The husband goes in at 8:30am and I go in at 10:30. Crazy that I am going to be getting shot full of his swimmers while he isn’t even in the building. LOL. Anyway – now the nerves set in!! Gotta remain calm… just your regular, every day ordinary turkey bastin’. You’re going to feel silly for stressing so much after it’s over. It takes like 2 minutes for the actual IUI… then you lie there for 15-20 minutes… then you get up, get dressed, and go on your merry way as if nothing happened (it’s kind of surreal). All this is to say, don’t be nervous, sweetie! Yea! It only takes one… I hope this is it for you! Just relax . . . . bahahahahahaha! Best of luck! LOL!! Ooooooh man, I needed that laugh. 😉 Thank you! I THINK I CAN, I THINK I CAN, I THINK I CAN GET PREGNANT!!! Excited for you! Go swimmers go!! !